I realize it's cliche, but I've dreamed for a long time of going to Paris to sit in the Cafes where the famous existentialists used to go. 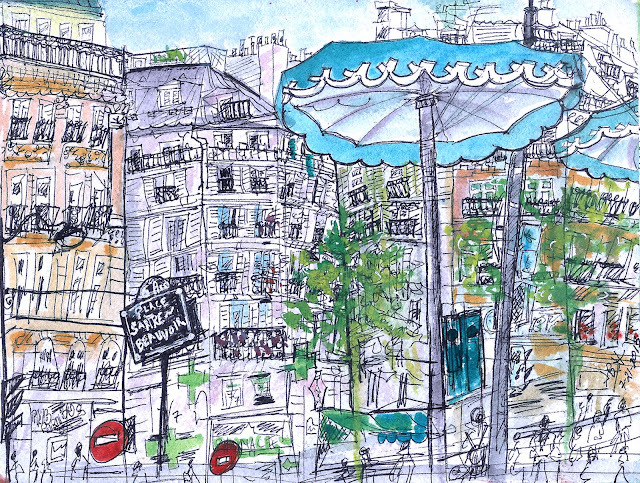 I finally made it to Paris a couple of weeks ago and got to spend some time on the Left Bank sketching in some of the historic Parisian cafes. This is the view from Le Deux Magots where Camus, Sartre, and de Beauvoir used to go. While sitting there sketching, my daughter and I met a man named Paul who lived in Paris for 24 years and owned an import store down the street called Simrane: http://simrane.com/. We spent a nice afternoon sitting there, sketching, and talking to Paul and afterwards he invited us to his shop and gave us some beautiful bags imported from India. I was going to go back afterwards and touch this one up, but decided to just leave it as is to keep the memory of the afternoon. My daughter grew up hearing me talk about Albert Camus and the Paris coffee shops. So, instead of the usual tourist stuff, we decided to create our own "Famous Parisian Cafe Crawl." We had planned to go to the Louvre that day, but we were so exhausted from our travels in Barcelona, Amsterdam, and Brussels the week before, that we ended up sleeping in until 11 and didn't want to short-change our Cafe Crawl. My daughter had the great idea for me to do one sketch with pieces of each cafe, so we went to 5 historical Parisian Cafes: Cafe Procope, Cafe La Palette, Le Cafe de Flore, Cafe Bonaparte, and back again for a 2nd time to Les Deux Magots. I ran out of room so had to squeeze everything in. This was one of the best days of my life ...hanging out with my daughter going from cafe to cafe, checking out art galleries on the Left Bank, and topped off with a fast ride on a bike buggy that whisked us from the River Seine to our subway stop to the Eiffel Tower. 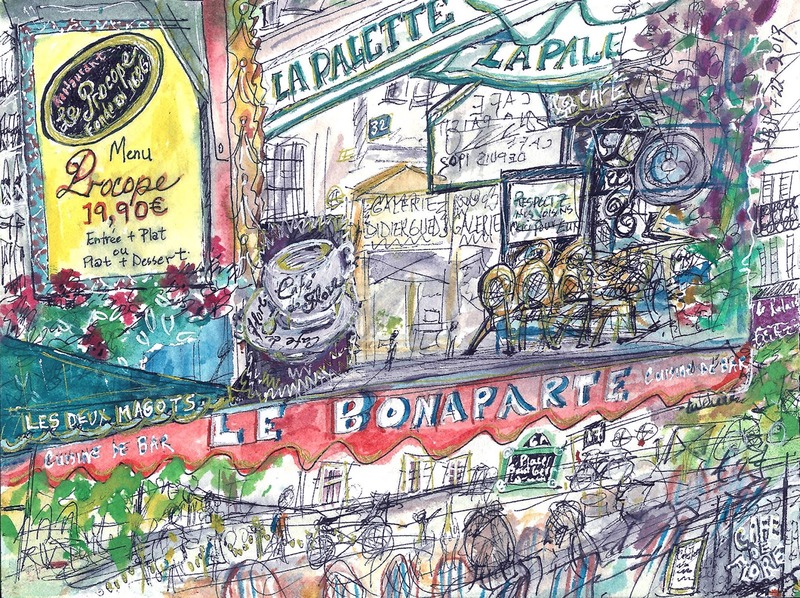 One of our favorites was Cafe Procope which in 1686 was the first coffee shop in Europe introducing coffee brought from Turkey and the first Cafe in Paris. The upstairs of the Cafe was as beautiful as what we saw the next day in the Palace of Versailles. An all-around incredible time. Love this story and the sketches to go with it. How wonderful you had that time with your daughter. It will be a great memory for her. Bravo, Jackie -- what amazing sketches! I can see you were inspired! What a great time! What fun and what a wonderful way to make a memory. You really caught the energy of Paris. Love these. So happy for you to have been able to do this. Great drawings. Nice going. beautiful and swirly. tres french.